A while back I was providing Sports Medicine services for a group of Mixed Martial Arts/ Brazilian Jiu Jitsu fighters. This was just a standard sparring practice on a Sunday afternoon rather than a more intensive training for an upcoming event. They were going “half speed” and wearing pads and head gear. One of the guys took a kick to the head. It didn’t seem particularly aggressive but he went down to the mat. He never lost consciousness but he definitely needed to take some time to himself and sit out of the practice for a little while. I went over and talked to him. He was alert. He knew his name. He knew who the president of the country was and what day it was. His pupils were the same size, not overly dilated, and he had no feelings of nausea. I instructed him to drink some water and catch his breath. At that point it didn’t seem like a major event. It was the sort of thing that is common place with contact sports. Back in the 80’s and 90’s we would say that he just “got his bell rung.” Whatever that means. After about five minutes or so I went back to check on him again. He was unable to remember me checking on him the first time. In fact he couldn’t remember much that happened between the time he was kicked and the present time. He was having headache symptoms and told me that he was having mental fog. At that point I had his girlfriend take him to the emergency room. It became clear that he had a concussion. Thankfully, his story ended well. He was able to take some time away from the sport and recover. At least he seems to have recovered. We now know that the effects of a concussion are cumulative. We don’t know what his life will be like in the future. If it’s just the one concussion he will probably be fine. Unfortunately we don’t know as much about concussions as we should. Here are some things that we do know. A concussion is the consequence of a traumatic brain injury (TBI). The brain floats in cerebrospinal fluid which is mostly water. Any time the head is forcefully moved or impacted, the brain can slosh around and impact the inside of the skull. Brain tissue, like any other, swells when it’s inflamed. Part of the trouble with brain tissue is that it’s completely encased in bone. If it swells there really isn’t any place for it to go. This creates an increase in intracranial pressure. The most innocent symptom of this is the feeling of pressure and a headache. Also just like any other tissue, it can take several weeks or months for it to heal. It’s hard to know how much damage was caused by the impact. There really isn’t a great correlation between the initial symptoms and the time it will take for an individual to heal. If there is another concussion following the first one before the brain is fully healed the chances of even more devastating consequences goes up greatly. If someone doesn’t take enough time off and continues to have repeated trauma to the head, even minor trauma, the person could well be on the way to CTE or Chronic Traumatic Encephalopathy. This will cause problems with thinking and memory, personality changes, and behavioral changes including aggression and depression. Over the past several years we have heard of all sorts of retired professional athletes committing suicide, having mental health issues, memory issues and so on. So what can we do about it? We need to address the issue from two angles. First we need to figure out how to prevent the incidence of concussions. Second we need better protocols to monitor and treat the condition. This of course depends on our ability to properly diagnose the concussion. Technology will need to come a long way to improve prevention, detection and monitoring of the condition. That technology then needs to become so commonplace that it is very affordable. So what can be done right now? The first thing that we can all do is recognize the importance of treating this. No one wants to see anyone suffer down the road. If you suspect a concussion you need to act immediately by getting checked out by a medical professional. Everyone gets caught up in the excitement of the moment, particularly in sports. The outcome of a game or a fight won’t matter in five years when the person is dealing with life altering consequences. Making sure you follow up with that medical provider and follow their directions is paramount. Here is a link to the protocol used in my office. https://www.ncbi.nlm.nih.gov/pubmed/30745095 . 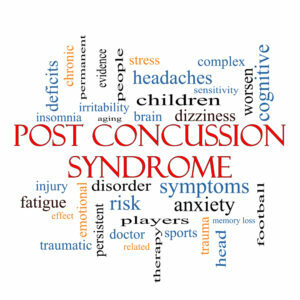 It outlines a strategy for managing the various aspects of the concussion including cervical spine treatment, vestibular rehabilitation, sleep management, low level exercise, headache management, psychological interventions, cognitive rehabilitation and vision therapy. This is a multifaceted approach that may involve co-management with various providers. The use of low level, supervised exercise is being studied in depth. Here is a link to one such study ( https://www.ncbi.nlm.nih.gov/pubmed/30768444 ) that used supervised exercise as part of treatment and resulted in an earlier return to sport. On the screening and diagnosis end there have also been recent advances. Blood biomarkers are being explored to help objectively identify the presence and severity of a concussion. This tool, if it becomes reliable, could also potentially be used to determine if the brain has healed. Here is a link to that study. https://www.ncbi.nlm.nih.gov/pubmed/30839351 . I am always looking for more information on this subject. If you have anything to add or if you just have a question, feel free to reach out to me. Dr. Hatch first become involved with sports medicine in the early 90’s as a high school athletic trainer. Upon graduation he was given an athletic training scholarship to Ricks College, now BYU Idaho, and worked with the football and basketball teams. In 2000 he was given the Sports Medicine Award (the highest honor given to a student athletic trainer at the college). Dr. Hatch went on to Logan University and dual majored to receive a Masters Degree in Sports Science and Rehabilitation and a Doctor of Chiropractic Degree. He now practices in Bridgeton Missouri at Smart Pain Solutions. Number one reason a person won’t go to a chiropractor?